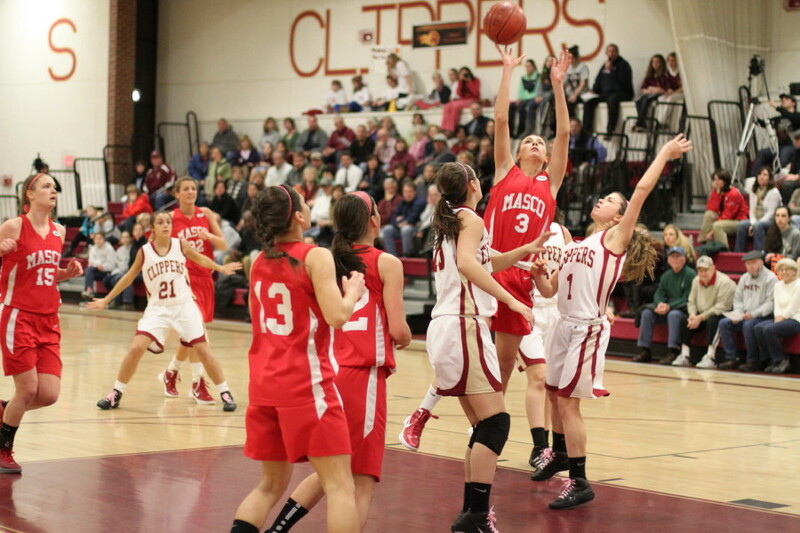 This is a collection of pictures I’ve taken during the 2011-12 Massachusetts High School basketball (girls/boys) regular season of players who will be active in the MIAA North Division of the post-season tournament. 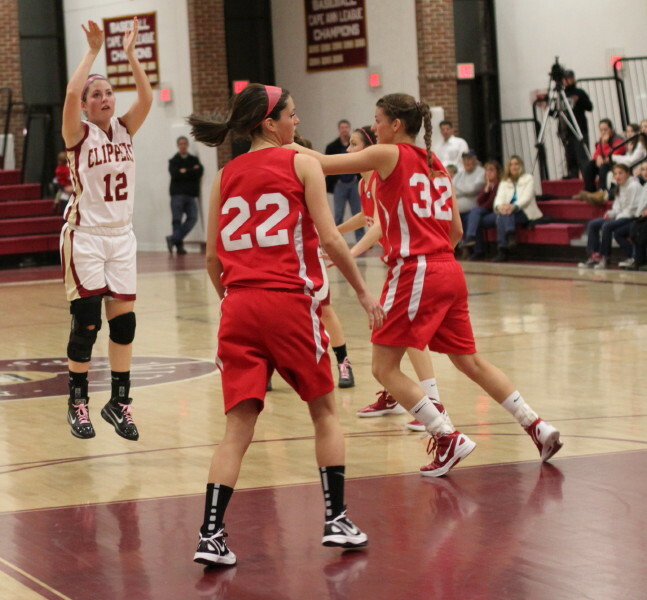 Brooke Stewart (27 points) fires up a long one. 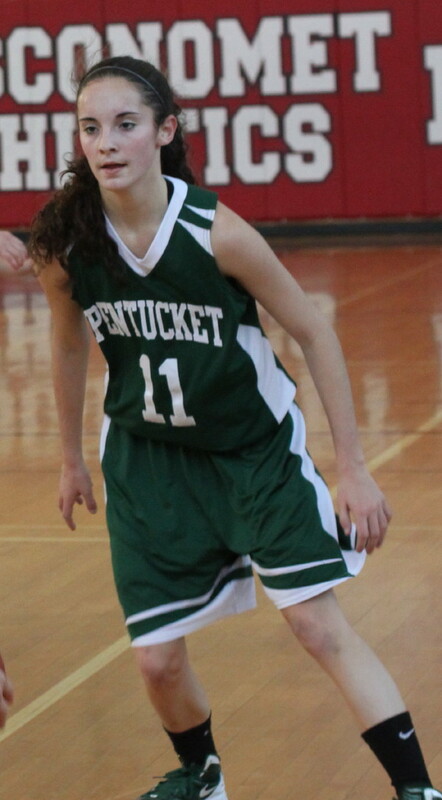 (Newburyport) Brooke Stewart is going to Division One William & Mary next year on a basketball scholarship. 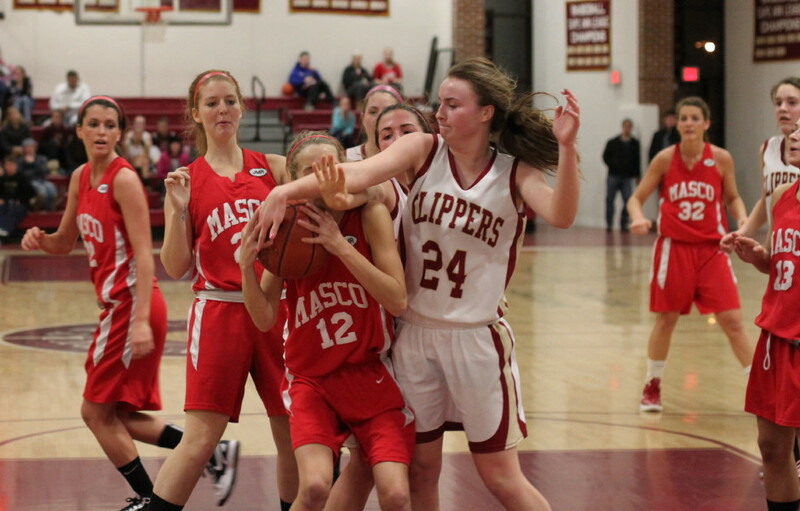 Those on hand at Newburyport last night saw why, as she tortured the Clippers with twenty-seven points leading Masco to a 60-49 win in Cape Ann League action. 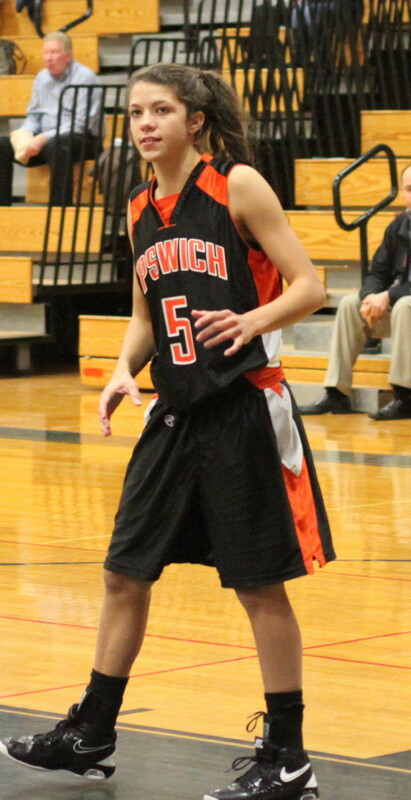 This was my third look at Brooke. 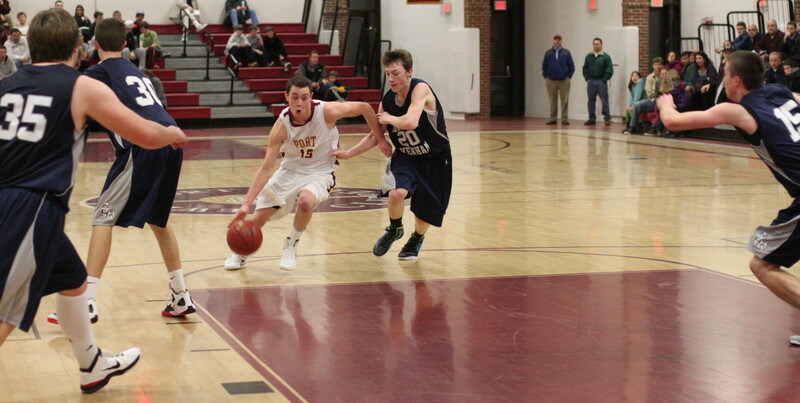 The other two times were against Pentucket, both losses. 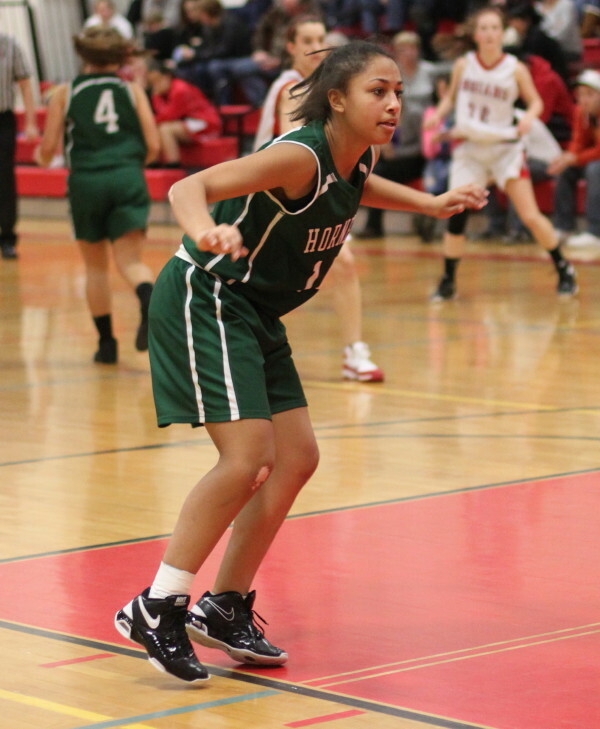 In those games Brooke faced total denial defense and had limited opportunities to do damage. 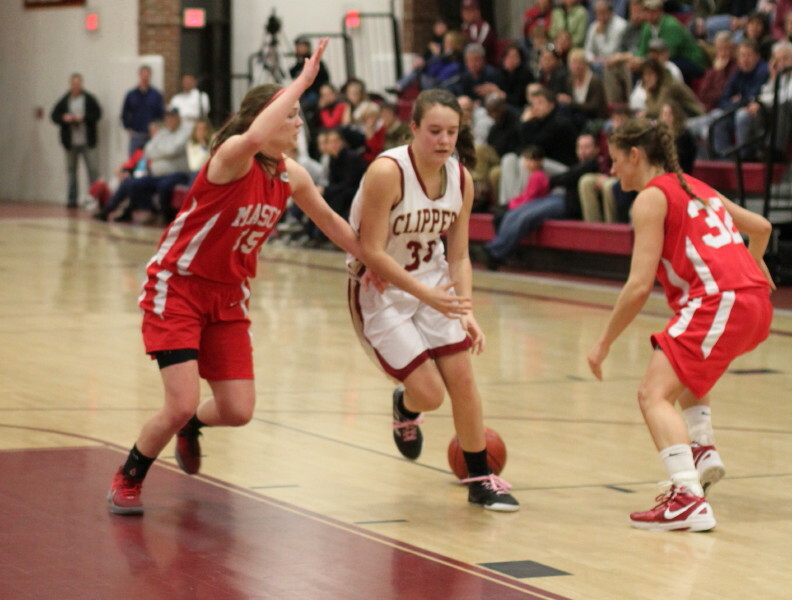 Against Newburyport, she had the ball plenty and had all the shots working. 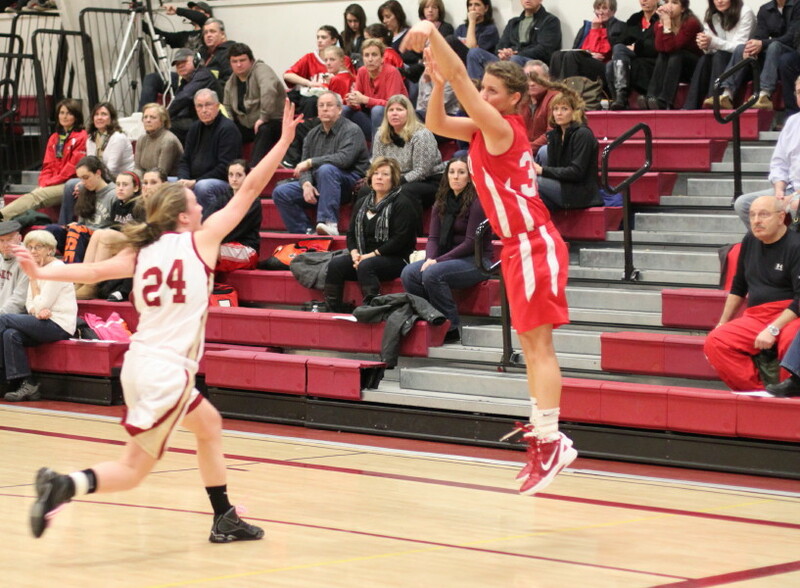 Brooke hit four 3’s and had numerous slashes to the basket. Defending her was simply a nightmare. 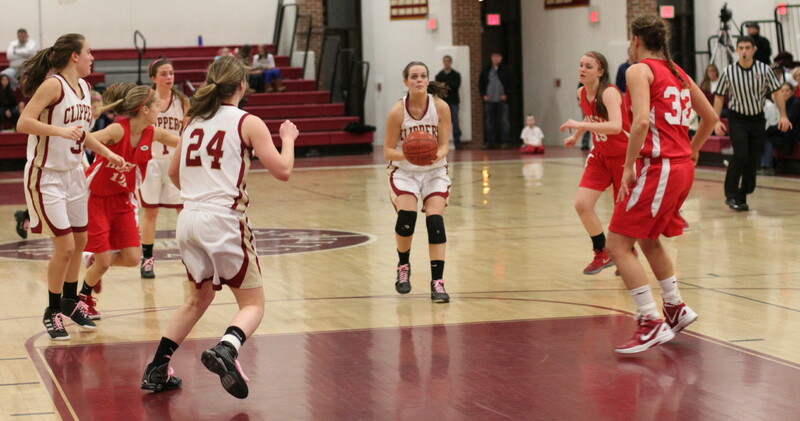 Newburyport (11-4 overall / 6-1 CAL) had won eight straight, and despite Brooke’s heroics only trailed by three (46-43) a minute into the final quarter. 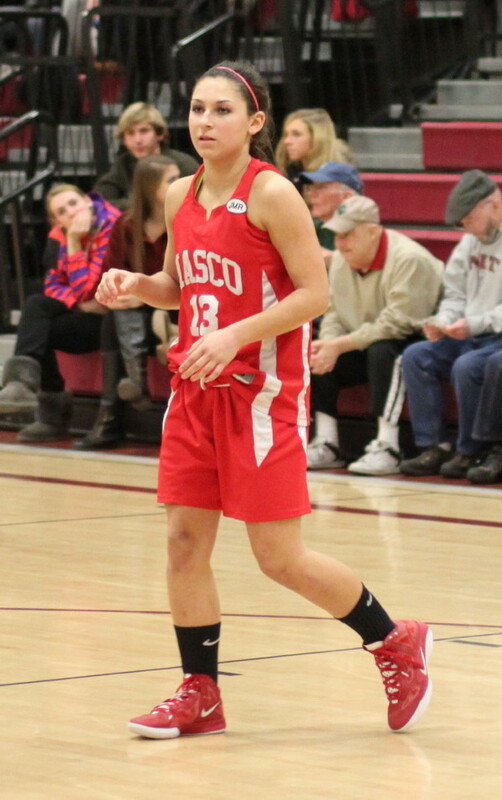 But a minute later, a Brooke layup followed by a three from Chelsea Nason (assisted by Danielle Davis) and Masco shot up by eight (51-43) and the Clippers couldn’t get closer than six the rest of the way. 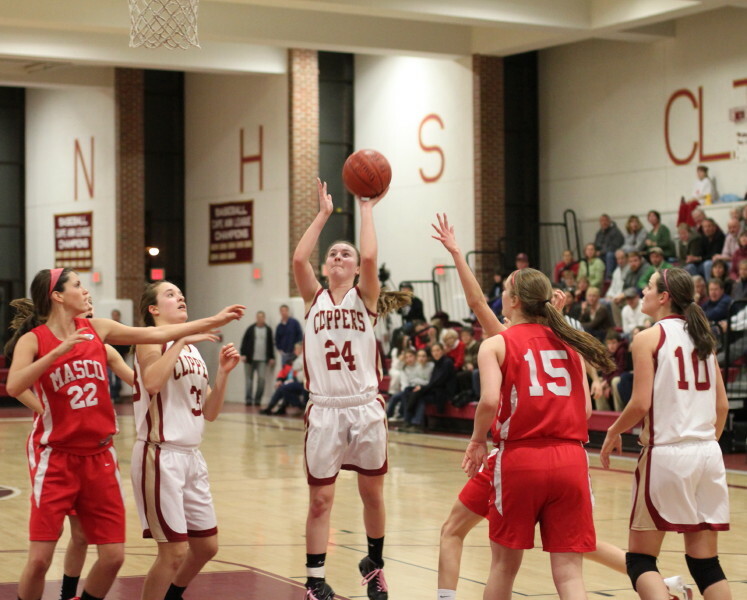 A big part of the Chieftain success was limiting Newburyport’s top scorer, Beth Castantini, to four points all late in the game. 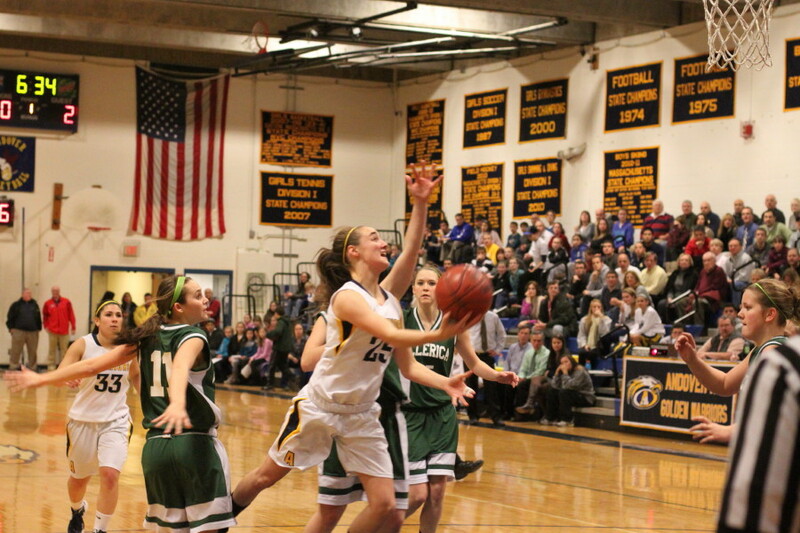 Foul trouble and facing Brooke as defender made for a long night for the talented senior. 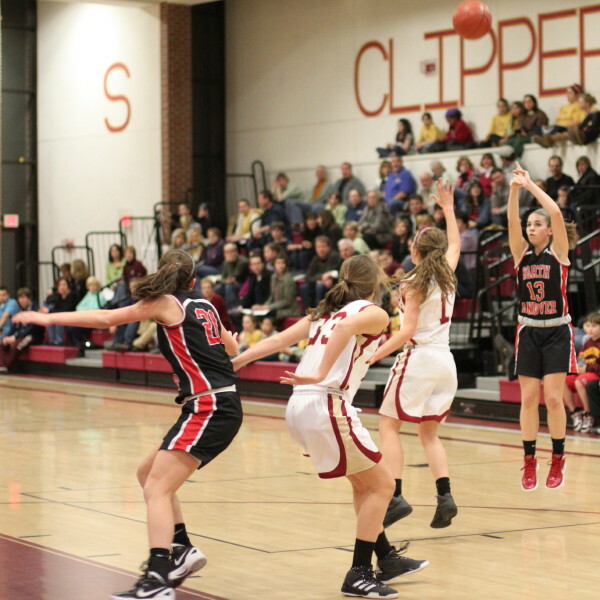 The Clippers went down ten (18-8) in the first quarter but rallied all the way back with five each from Lilly Donovan and Molly Rowe. 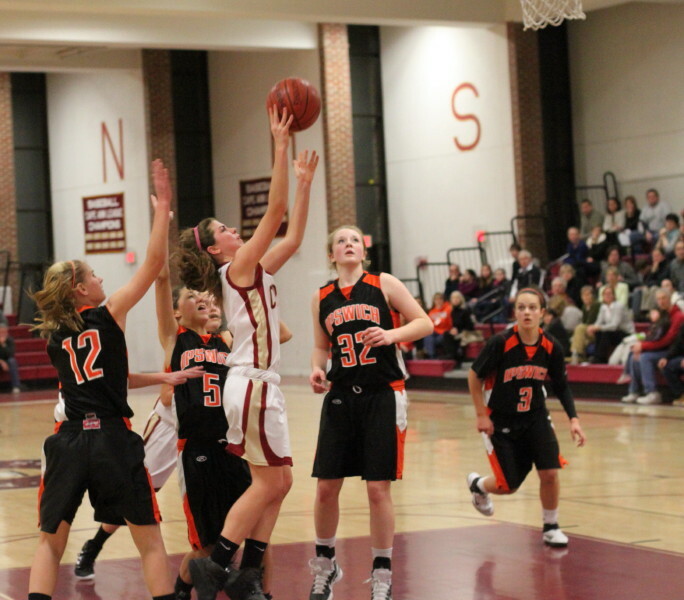 Newburyport was again down ten (31-21) in the second quarter and answered with nine straight (Molly Rowe-3, Lea Tomasz-2, Lilly Donovan-4) to get within one (32-31) with five minutes left in the third quarter. 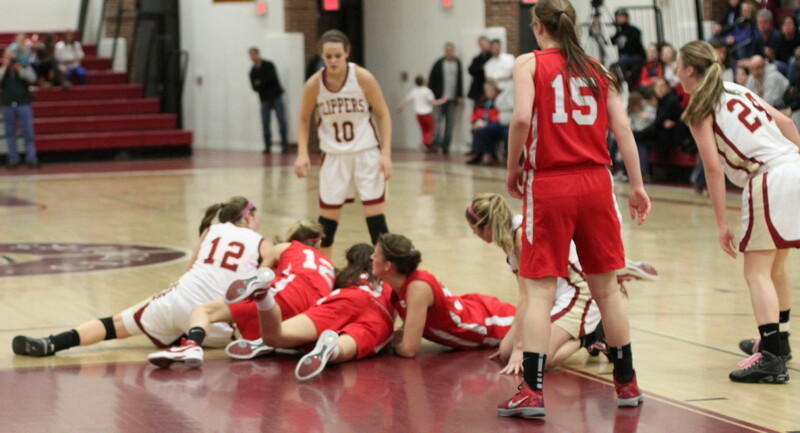 Thanks to Brooke (sixteen points over the final thirteen minutes) Newburyport never caught up the rest of the way. 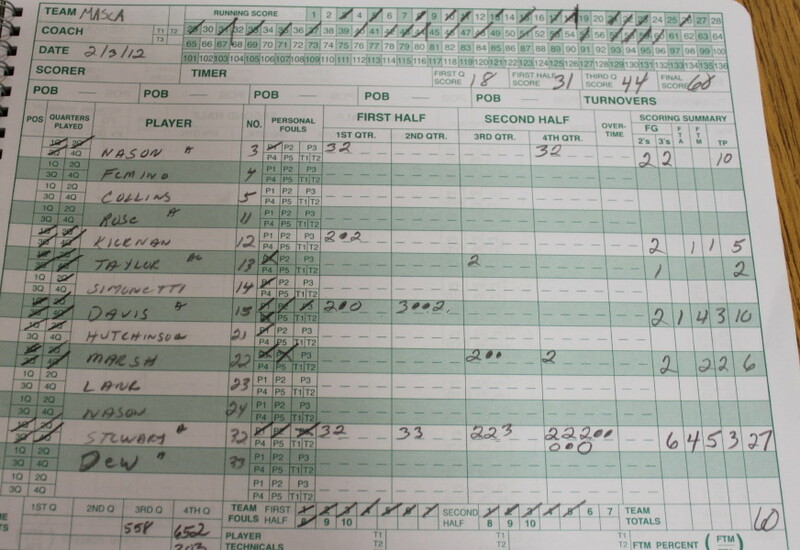 The eleven-point spread (60-49) at the end was an inaccurate indicator of the difference between the two teams. 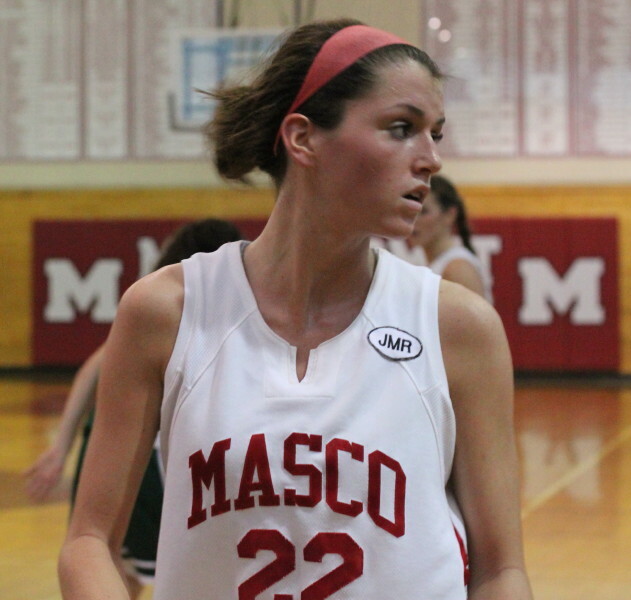 Masco (11-2 overall / 7-1 CAL) has now won eight of their last nine games and will be at Triton on Tuesday. 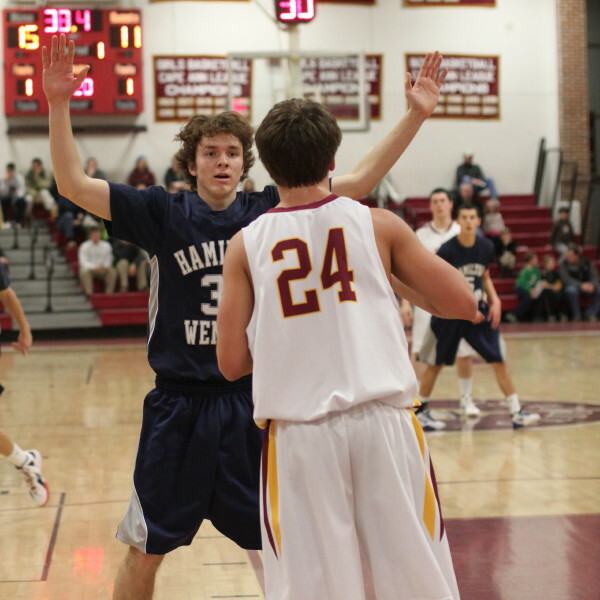 Masco made seven 3’s. 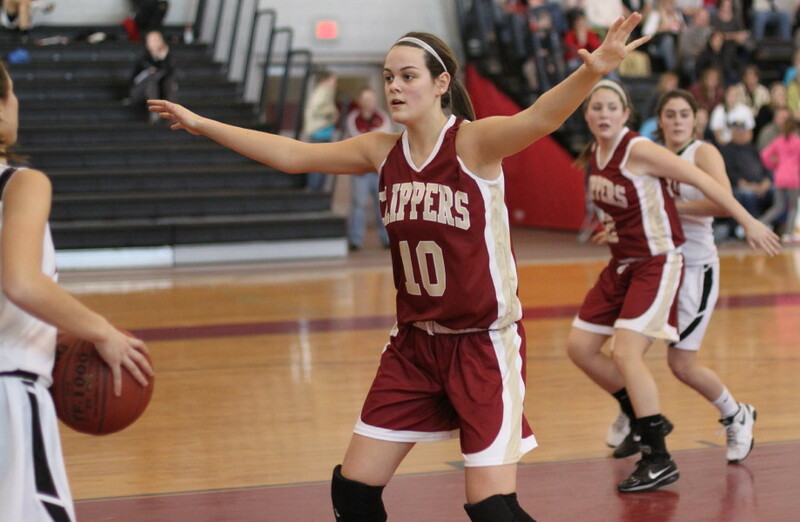 The Clippers lone three was a Molly Rowe (11 points) buzzer beater at the end of the first quarter. 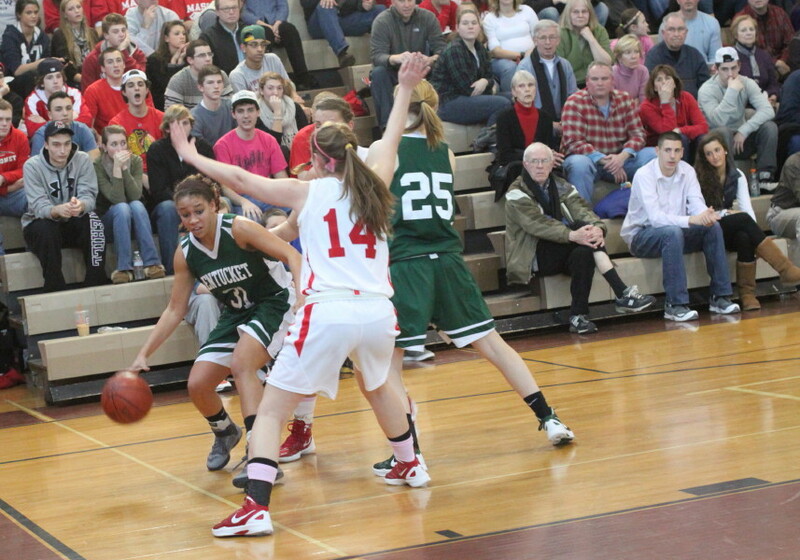 Molly Rowe came out of this scramble with a back injury. 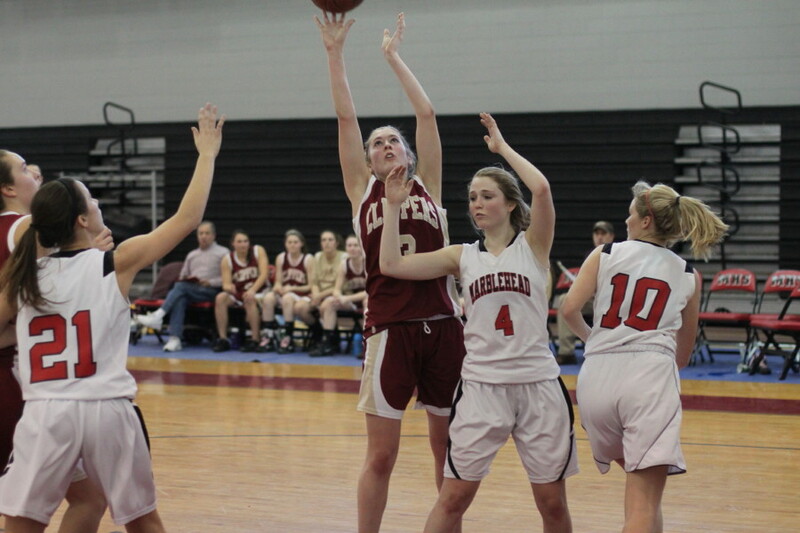 Molly was injured (back) in a scramble midway through the last quarter and never returned. 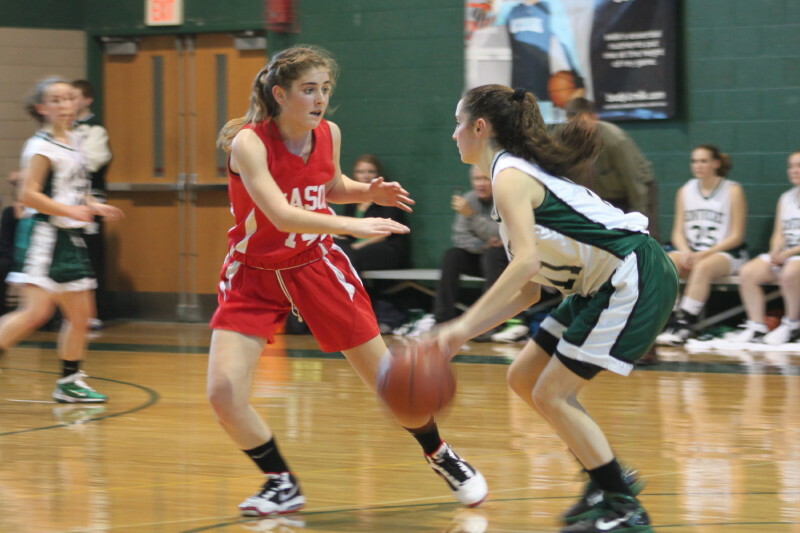 Sophomore Lilly Donovan ended up chasing Brooke around most of the game yet still had enough energy to put up a team-leading fourteen points. 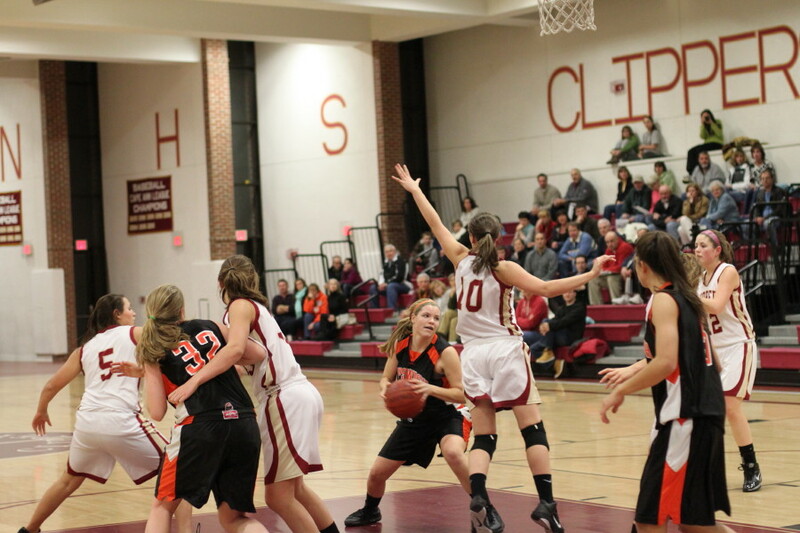 Chelsea Nason and Danielle Davis each had ten points for the Chieftains. 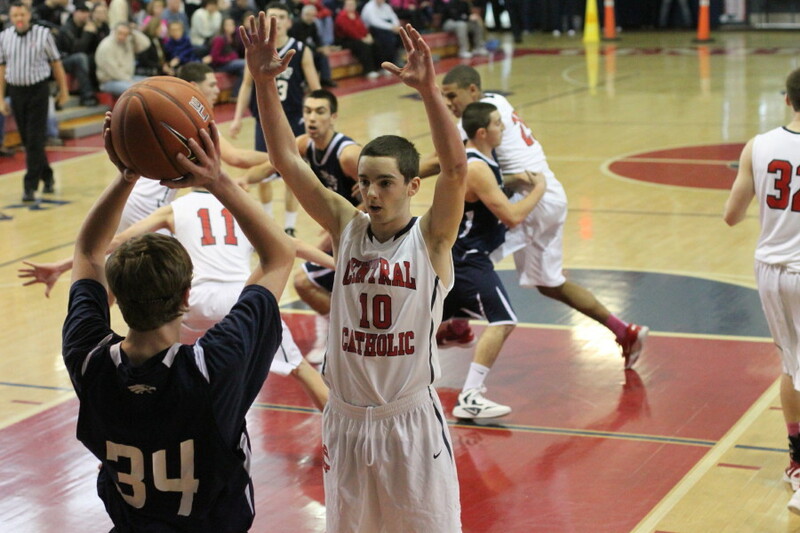 Both teams have qualified for post-season play. 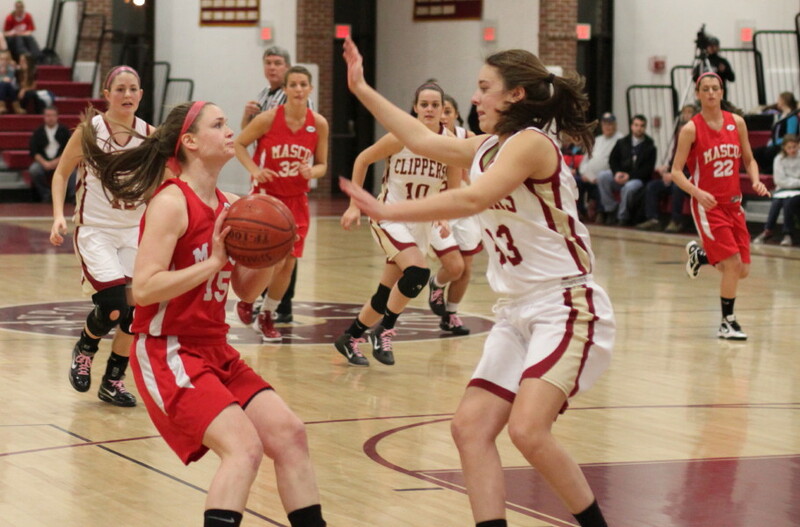 Masco is in Division 1 and Newburyport in Division 3. 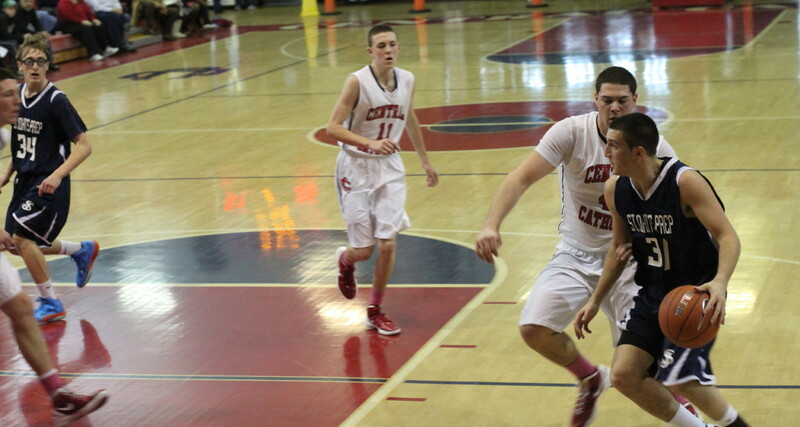 The two referees arrived late for the second half. 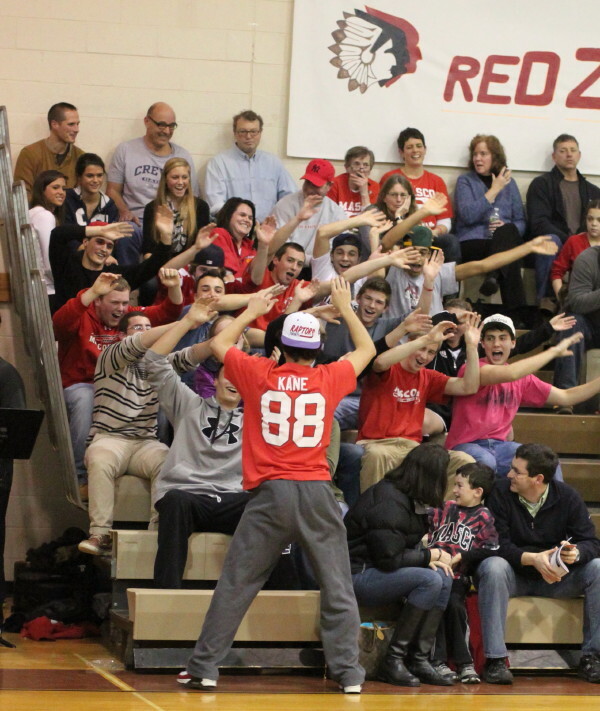 I trust that they did not assume that the cheer they received upon arrival was affectionate. 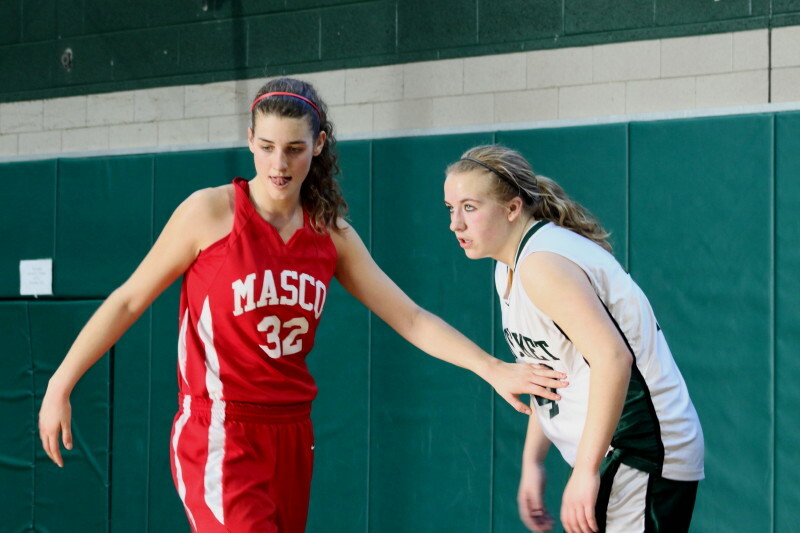 Masco’s Brooke Stewart (#32) calls for the ball against Pentucket’s tight defense. 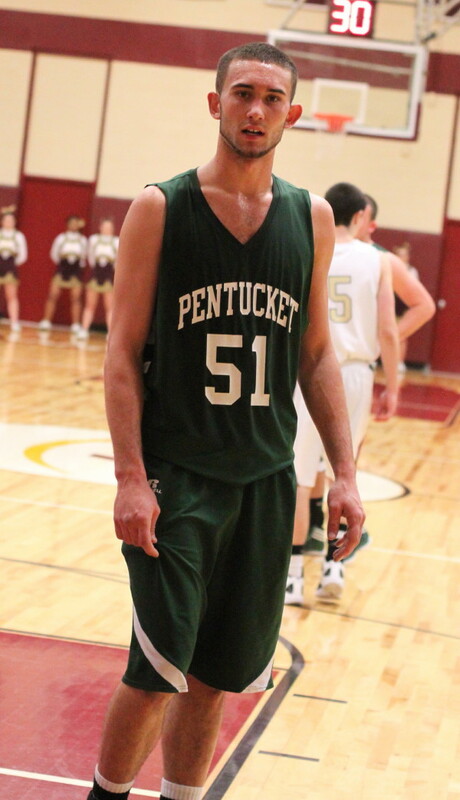 (West Newbury) I didn’t see Pentucket’s 61-60 squeaker over Masconomet on December 29th at Masco. 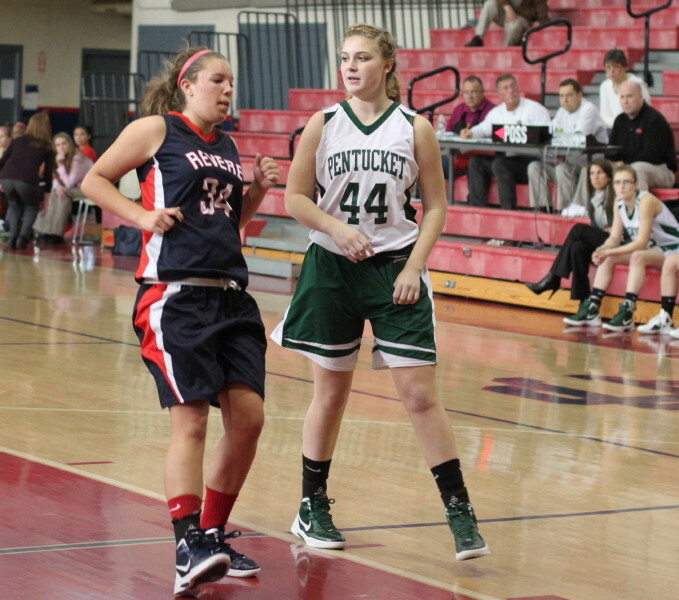 In fact, I didn’t see all of this afternoon’s rematch in which Pentucket was a 50-33 winner. Anyhow, I missed the first quarter and only scripted the second half. 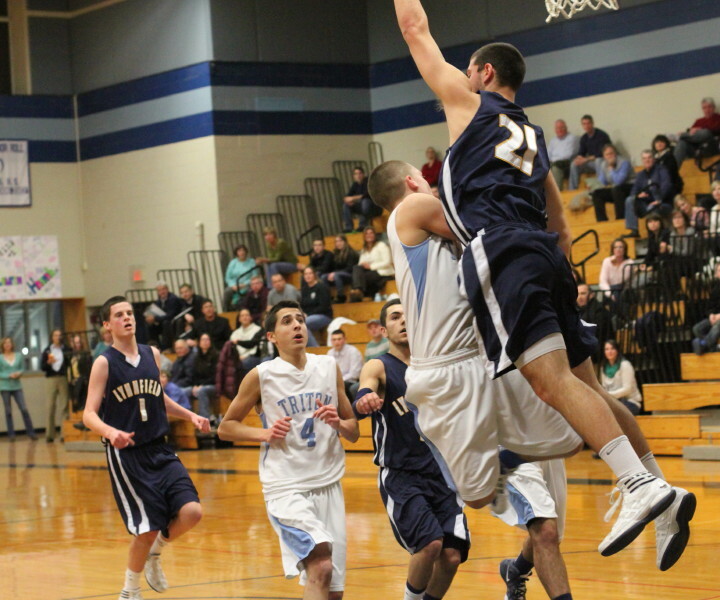 I’ll rely on Mike Grenier’s game story from the Salem News for what I missed. 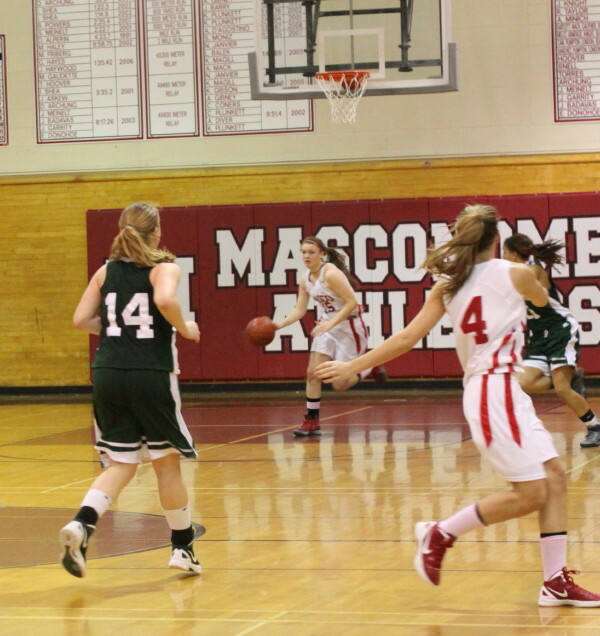 Masco (7-3) put up 10 points in the last 4 ½ minutes of the game but struggled mightily to make shots before that. 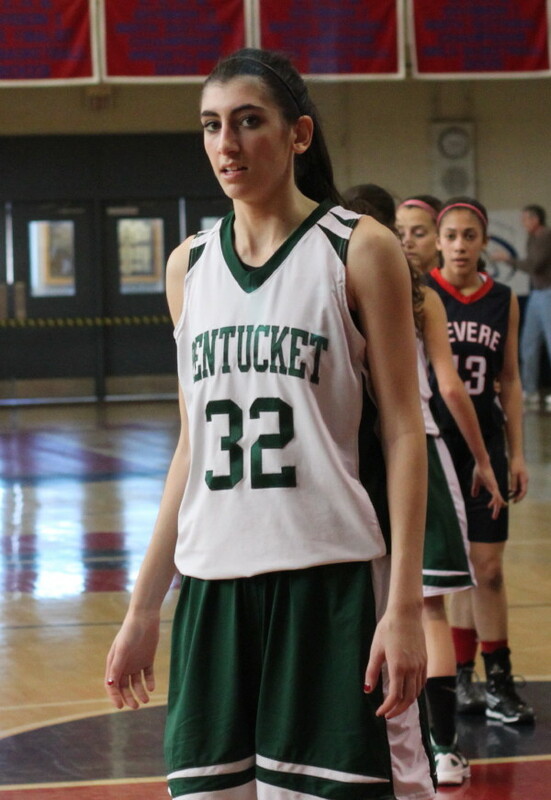 The tall, pesky Pentucket defense was part of their problem. 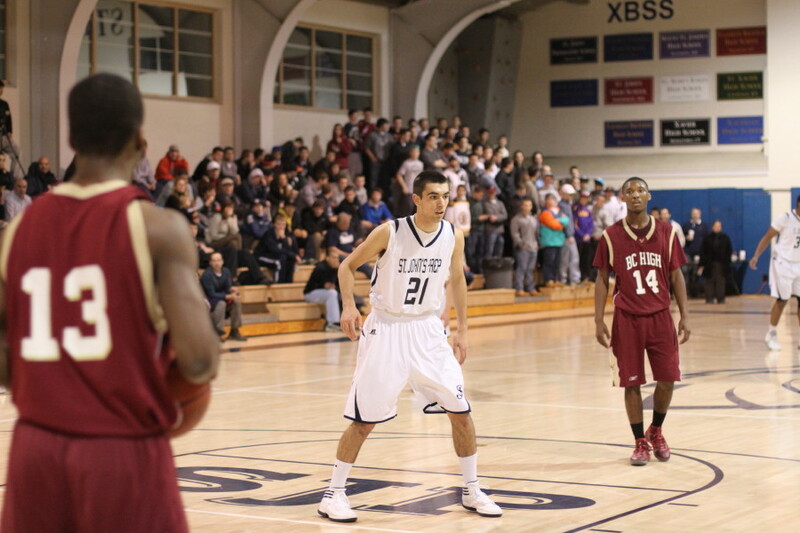 The rest was just an overall inability to make shots. 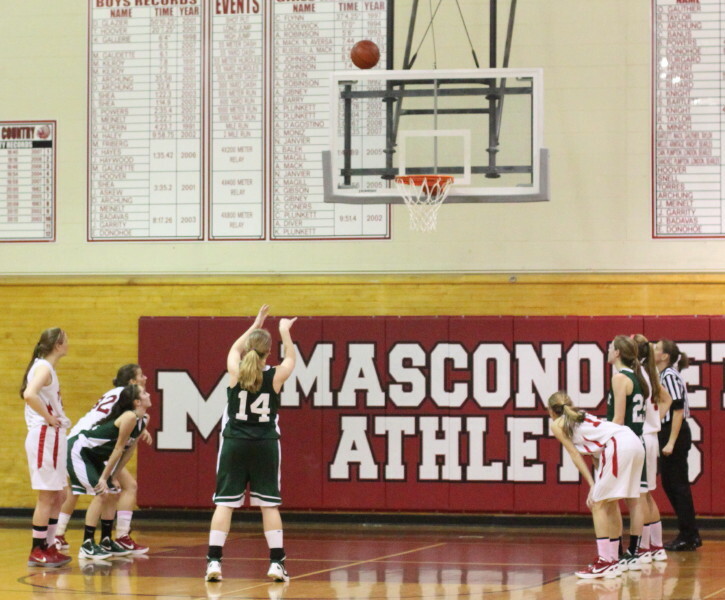 Credit the Sachem defense but what about Masco’s 5-for-17 from the foul line with a number of those being one-and-one’s. 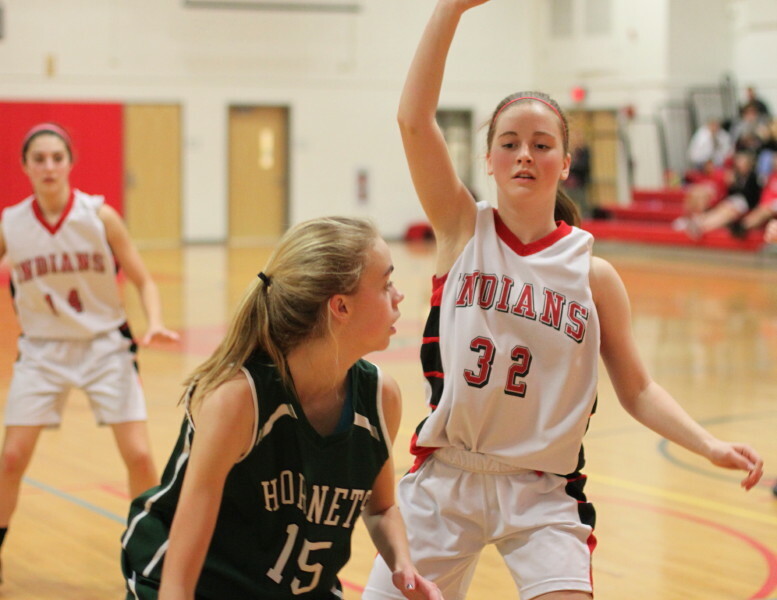 The Sachems (7-1) hadn’t played in nine days (loss to North Andover) and appeared to have all sorts of defensive energy stored up. 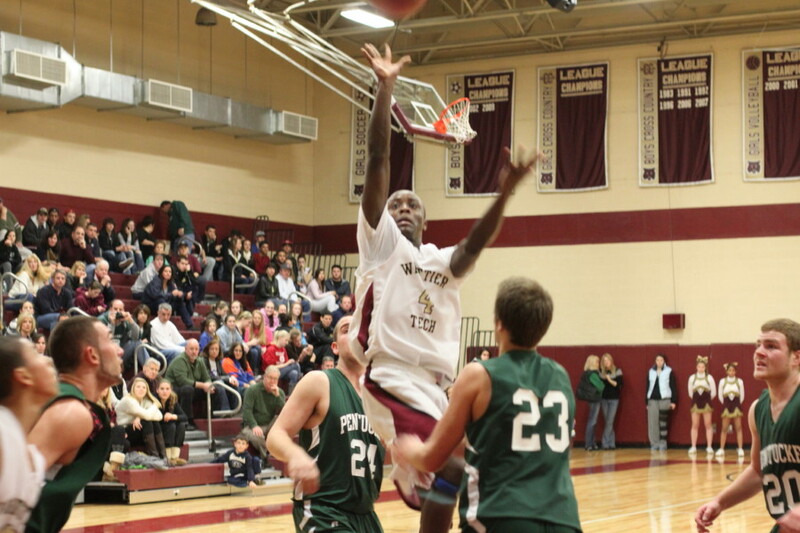 Pentucket coach John McNamara had those practice days to bring his normally effective defense back to its normally effective self. 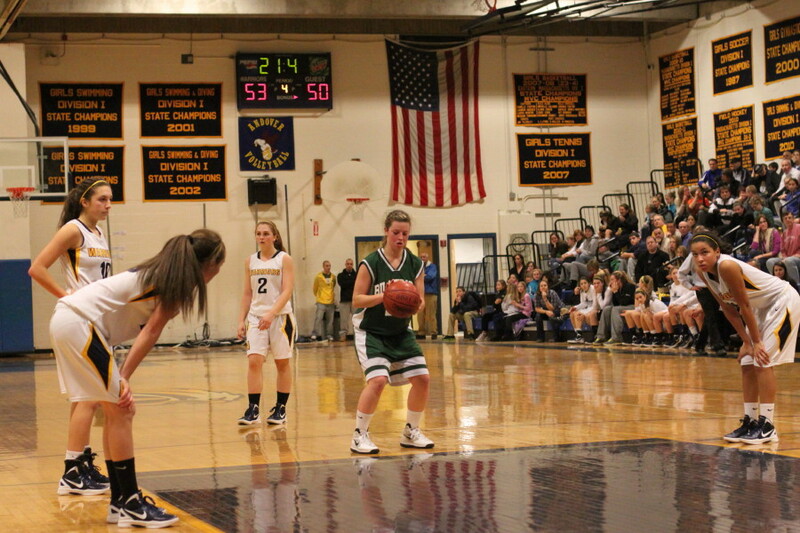 What could be tougher than facing a well-rested, heavily-drilled, Pentucket pressure defense on their court? 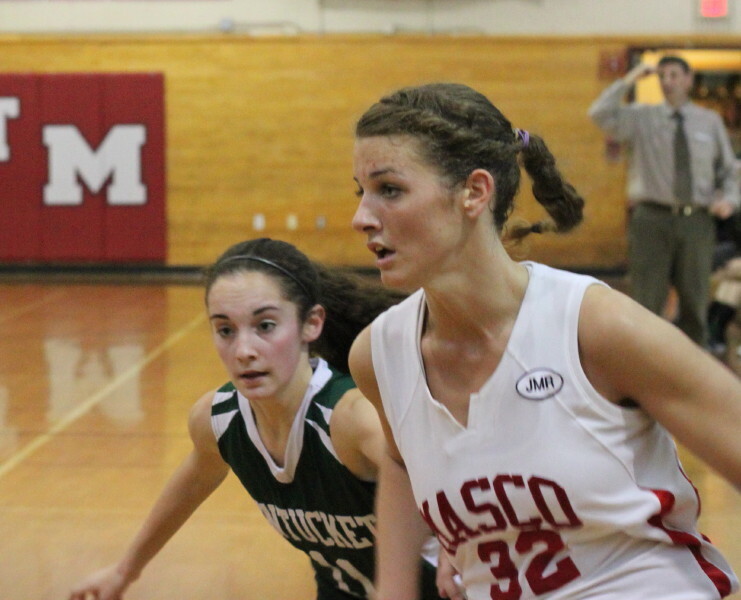 Masco’s Brooke Stewart had 24 points during the last meeting but this time had few openings and no easy shots and ended up with thirteen points. 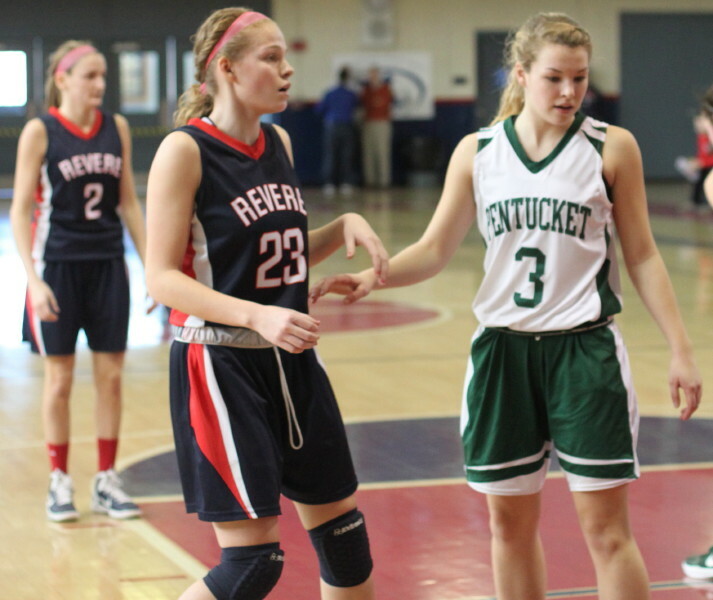 Brooke (6’ junior) had plenty of company everywhere she went. 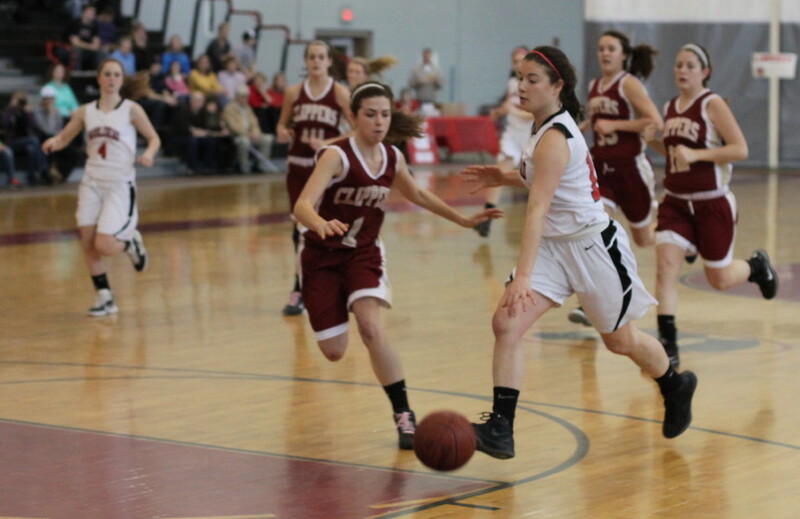 Tess Nogueira gave her the same denial coverage I saw her effectively put on Newburyport’s Beth Castantini. 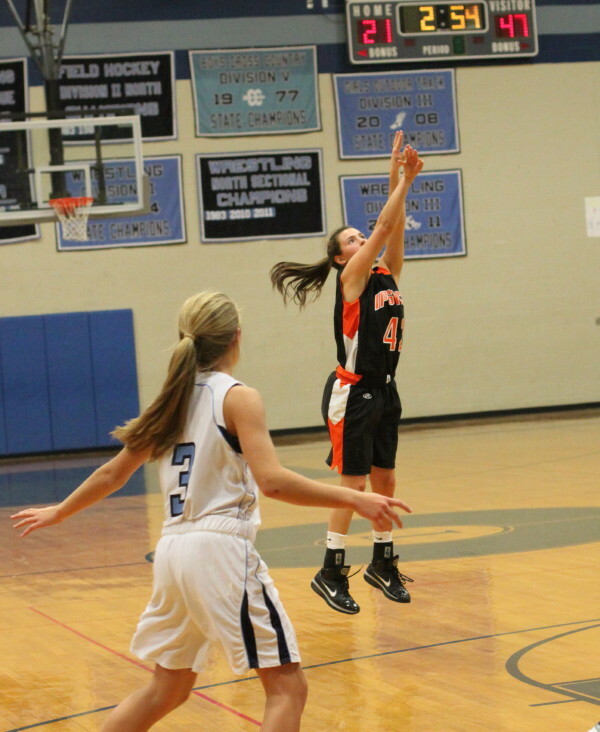 Brooke had nothing but low percentage shots available even when she actually got the ball. 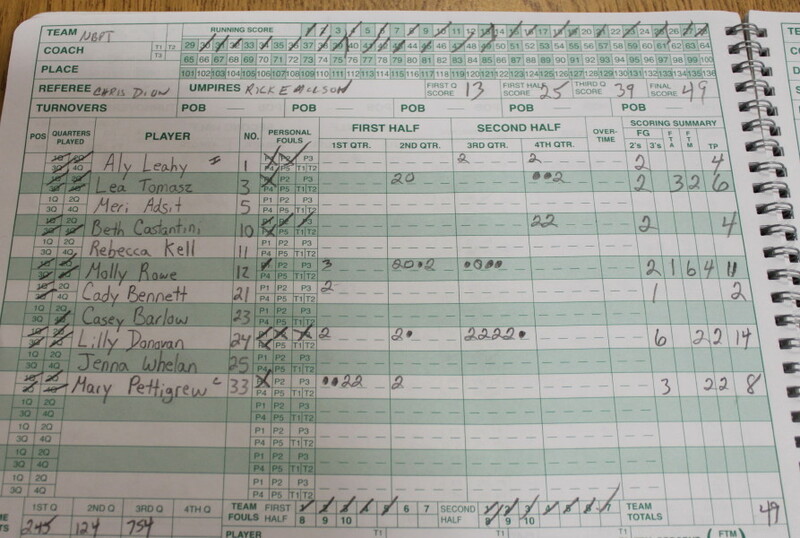 In this game, she didn’t have teammates to share the scoring load and loosen up the defense she faced. 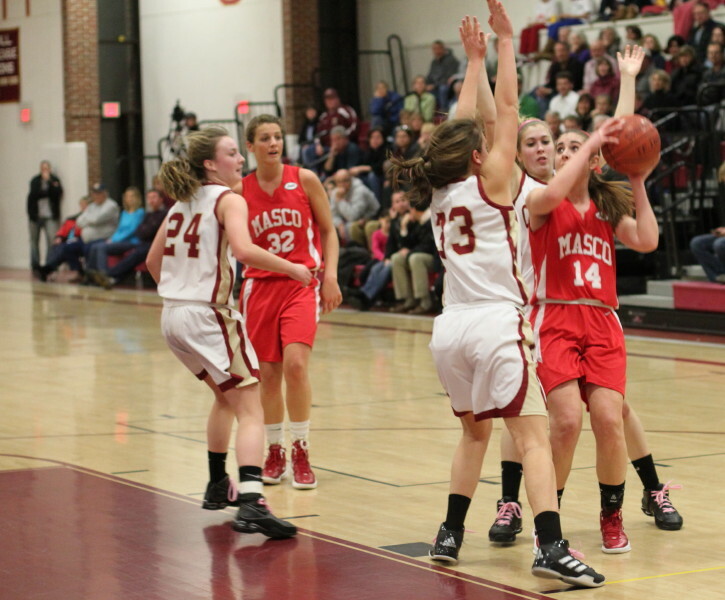 I looked at Masco playing man-to-man defense for the 3 quarters I watched. 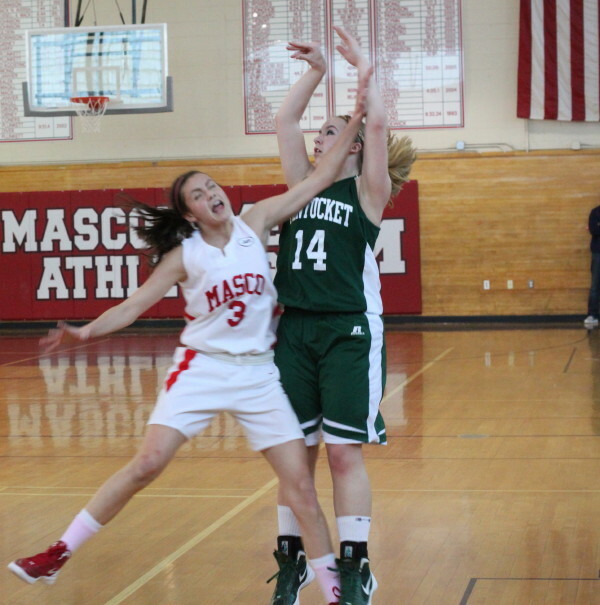 I read that in the 61-60 game Pentucket struggled against the Masco zone defense. 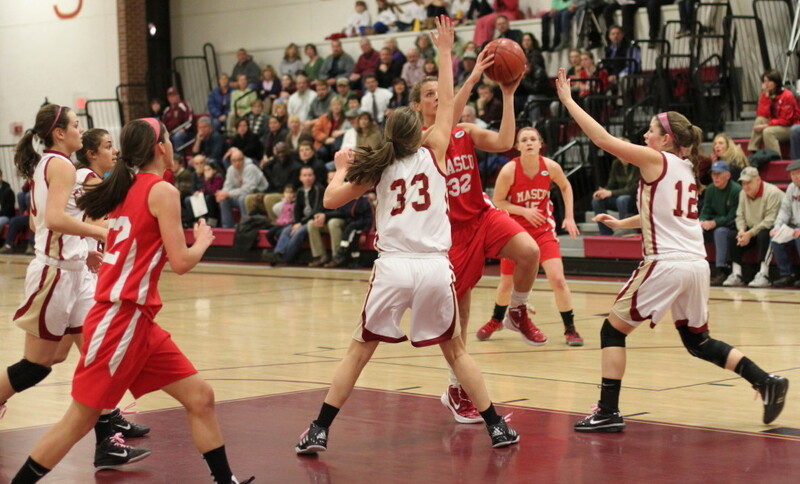 That 16-9 start in this one may have forced Masco away from zone defenses. 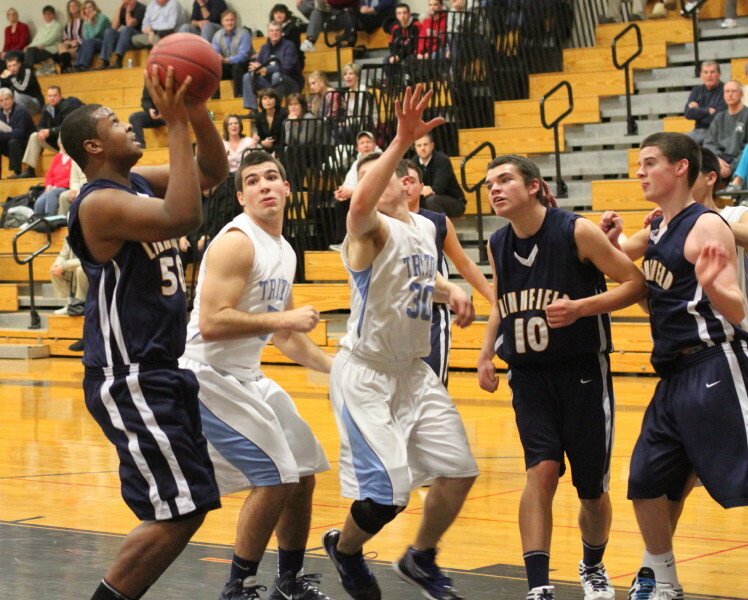 The Sachems have many players capable of getting to the basket against man-to-man defenses. 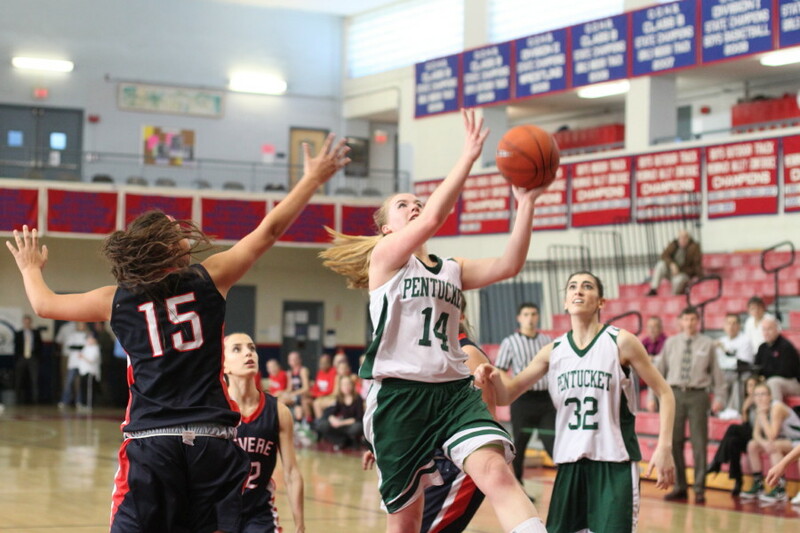 In a game the home team won by seventeen points, you can only imagine what the separation might have been if Pentucket had shot better than 19% (7-for-36) in the second half. 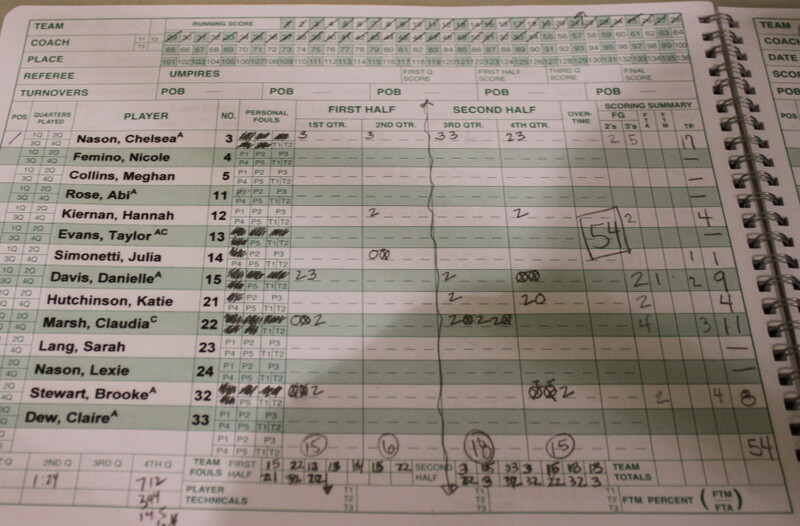 A stat comparison shows Leigh McNamara, Vicky Cahill, and Sarah Higgins totally 35 points in the one-point, first game win. 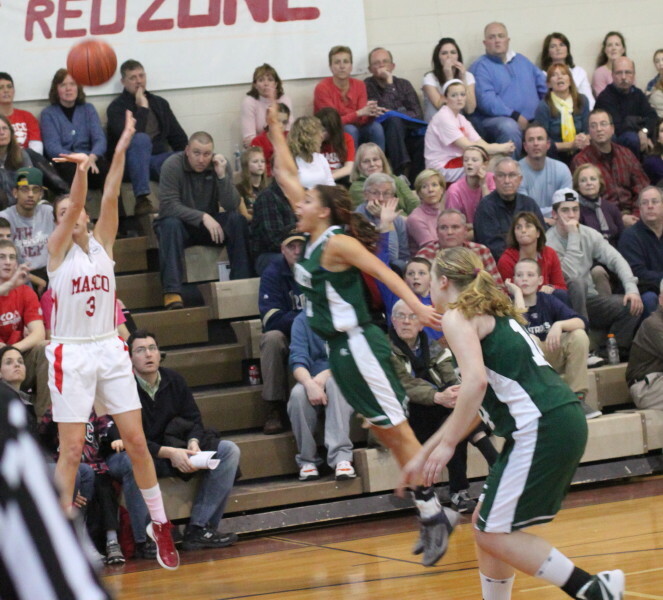 Versus Masco a second time, those three total eleven points and Pentucket wins by seventeen. Point? 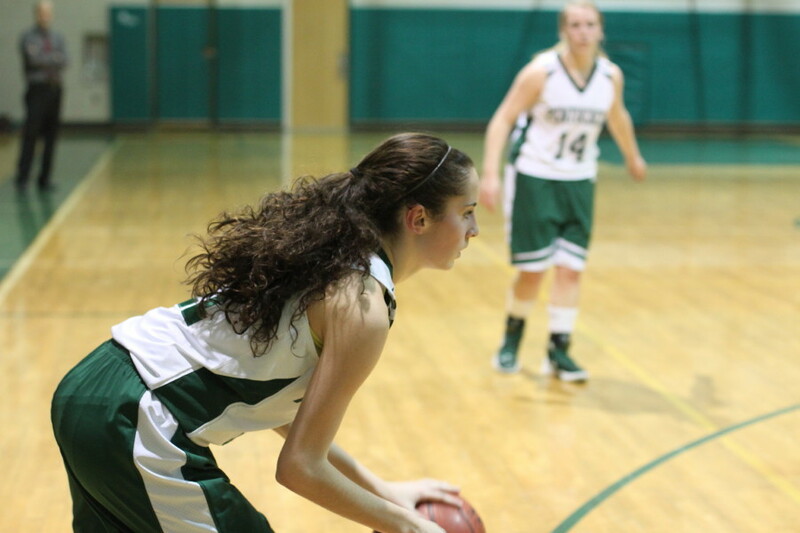 Nicole Viselli will usually score the most points but after that the Sachem scoring weapons are varied and numerous. 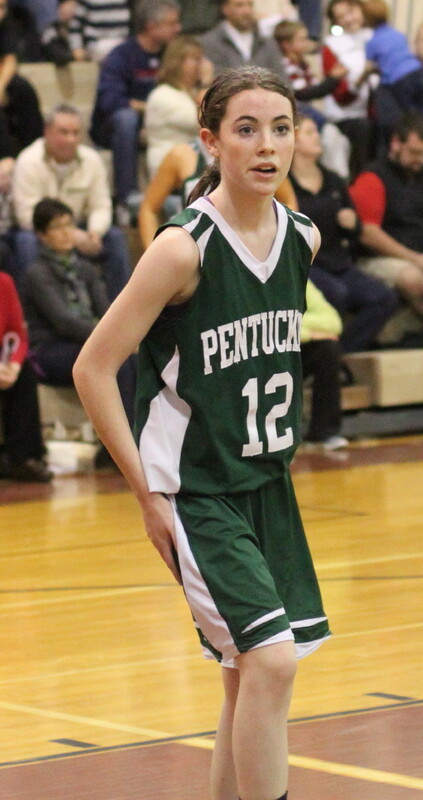 Every team knows that Pentucket will attack defensively and tirelessly. 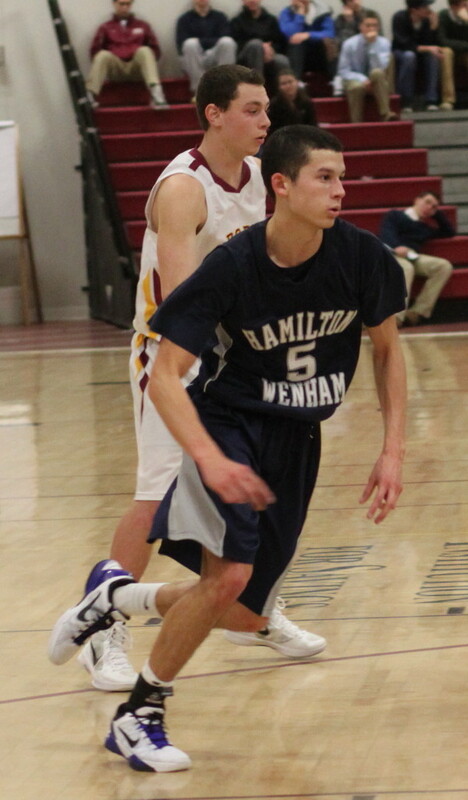 Court vision and accurate passes are the two solutions but the Sachems size and hustle make those two a tough task. 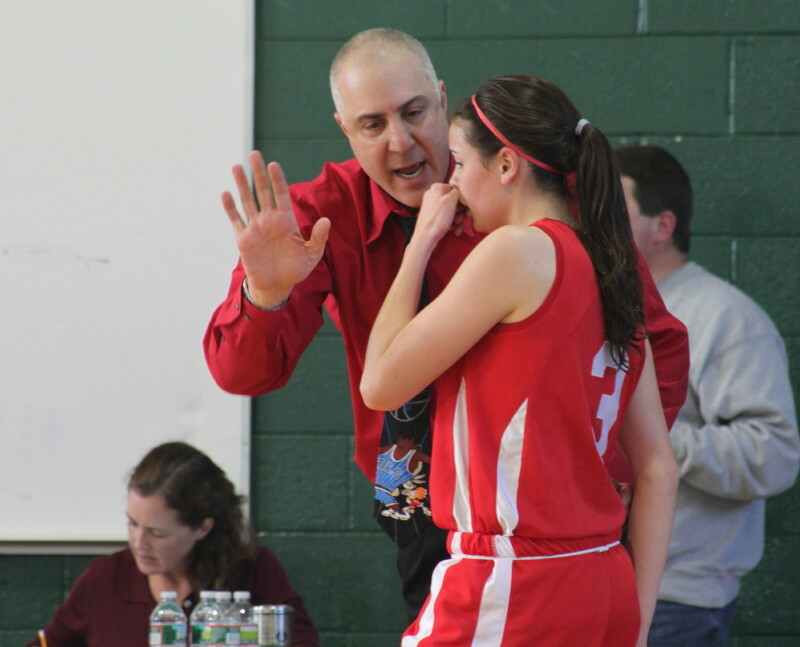 Masco coach Bob Romeo chats with Chelsea Nason in the second half. 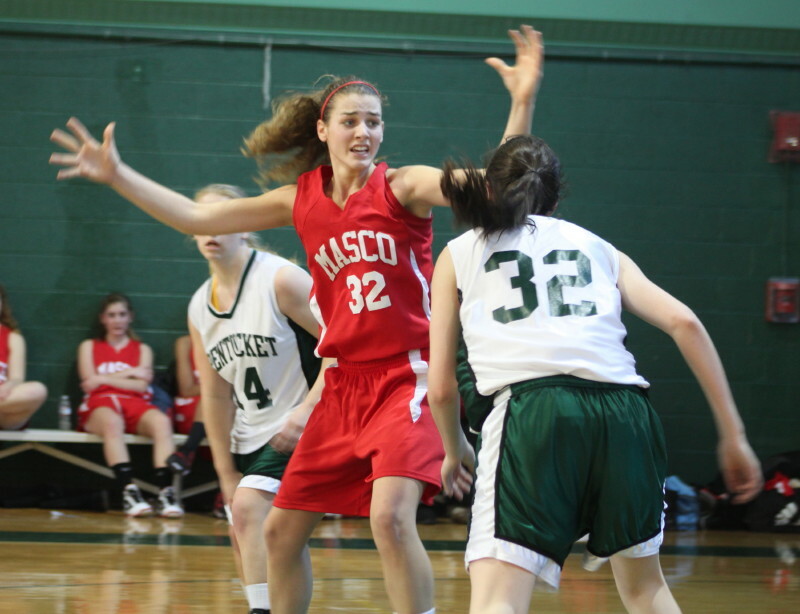 Masco was clearly victimized by that defense in their fatal four-point third quarter. 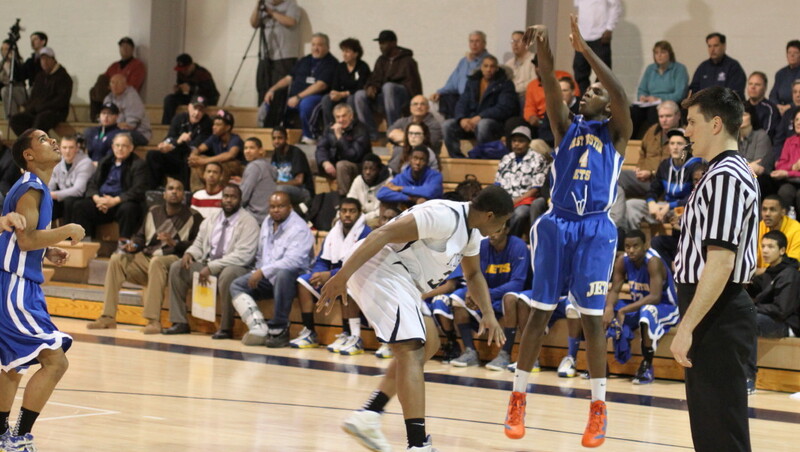 First seven possessions; five turnovers and three missed shots. 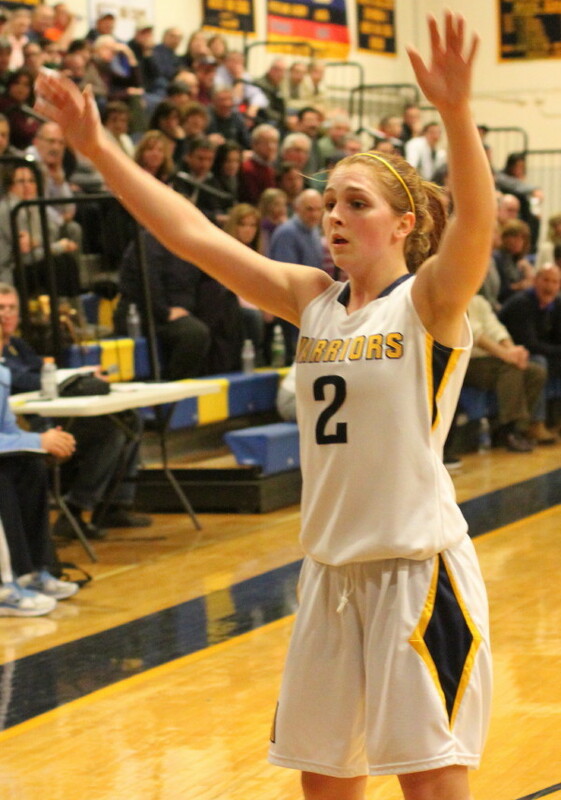 A Brooke Stewart layup was followed by four more turnovers and two more missed shots. 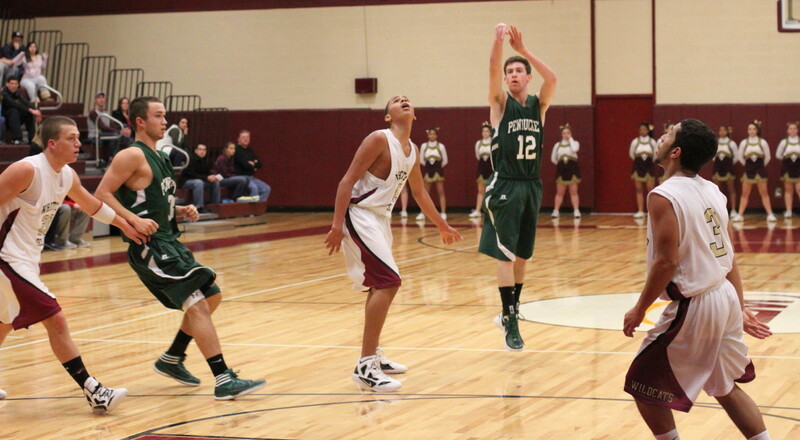 Pentucket wasn’t a whole lot better with the ball either. 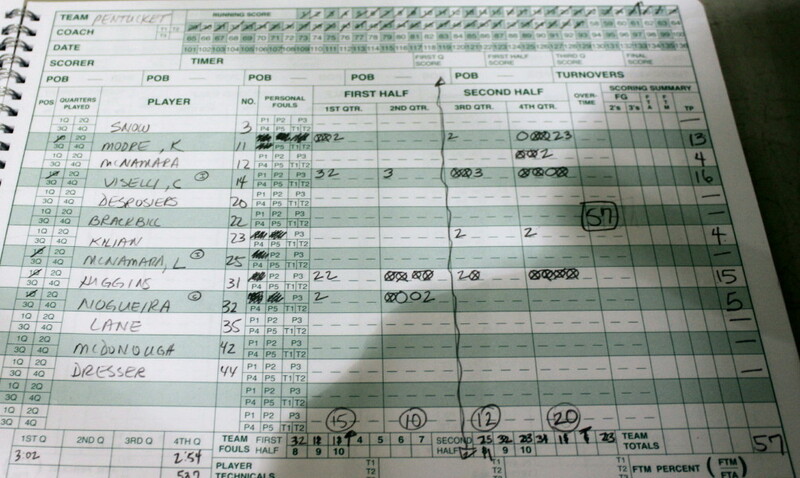 They did get six points but they too, during this same six minute segment, had six turnovers and missed nine shots. Maybe the sun was in their eyes. 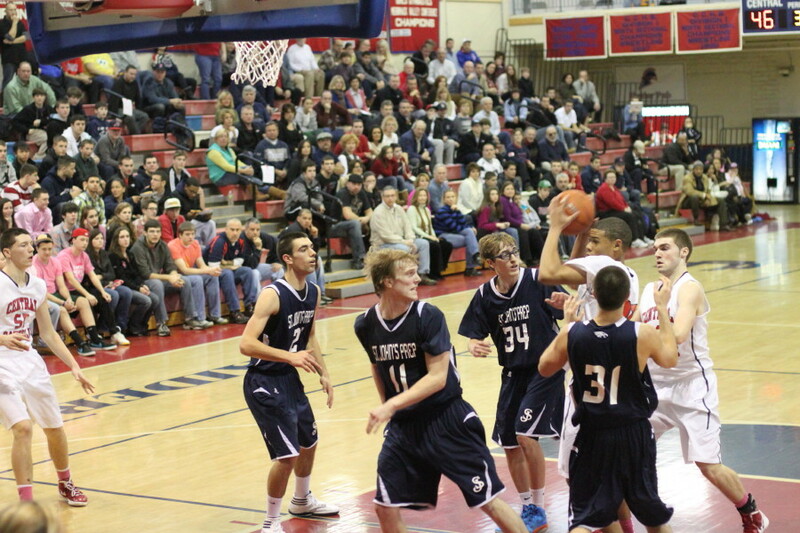 It poured in for the entire game, making one end difficult to defend on and the other one hard to see the basket or anything else. 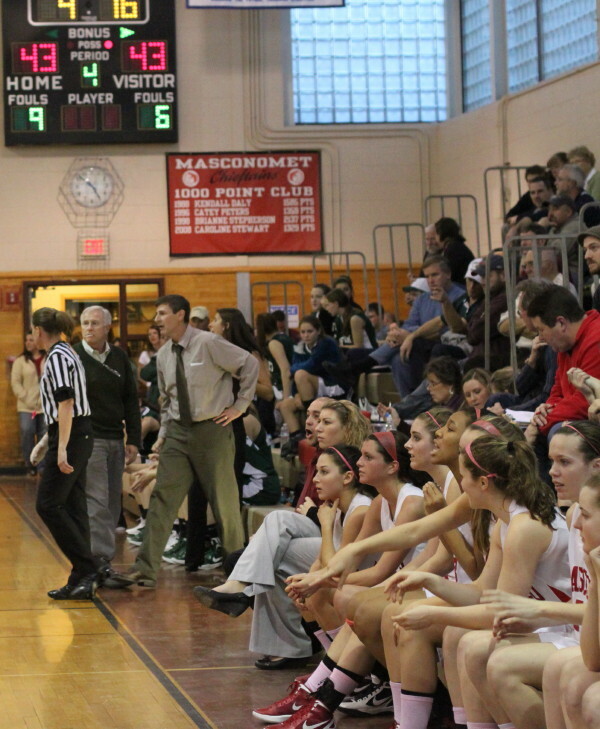 I’m guessing that the folks who scheduled an afternoon game at Pentucket failed to consider the sun factor. 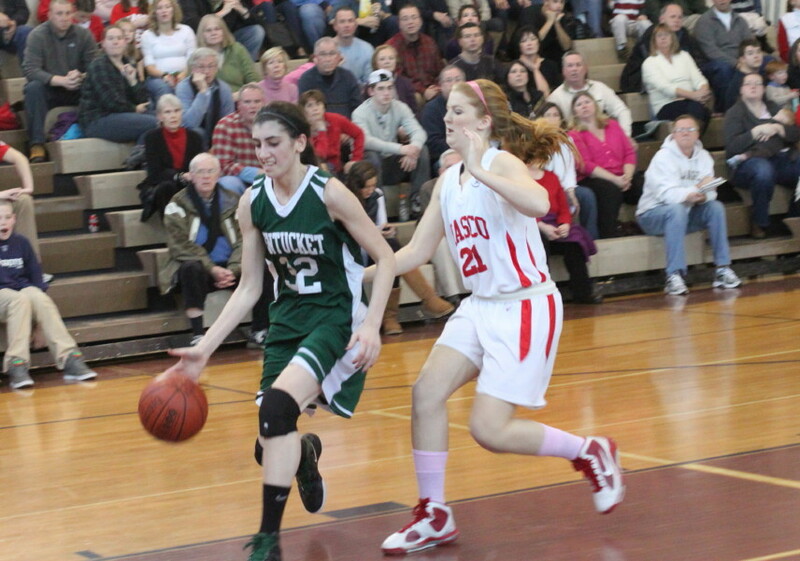 Brooke Stewart defends another of the area’s top scorers, sophomore Nicole Viselli. 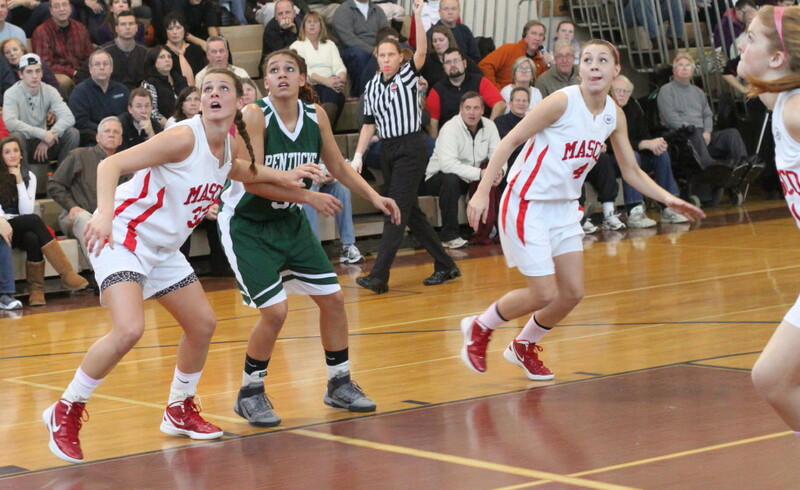 Two of the top scorers in the area (Brooke Stewart and Nicole Viselli) were in the game. 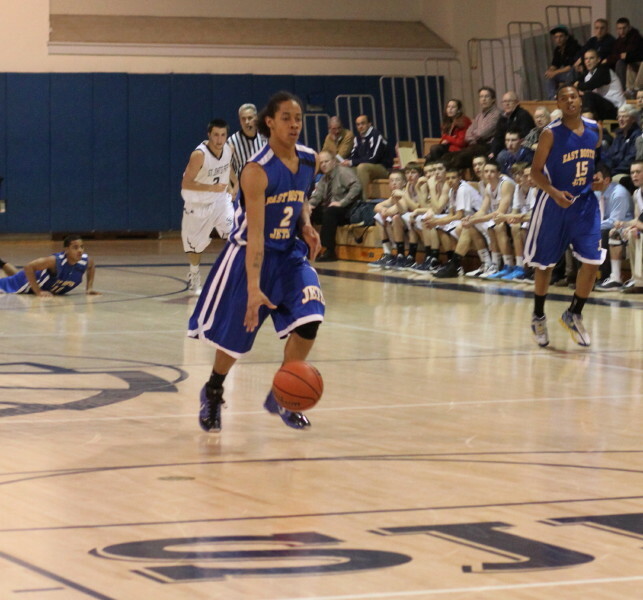 Nicole led all scorers with seventeen points. 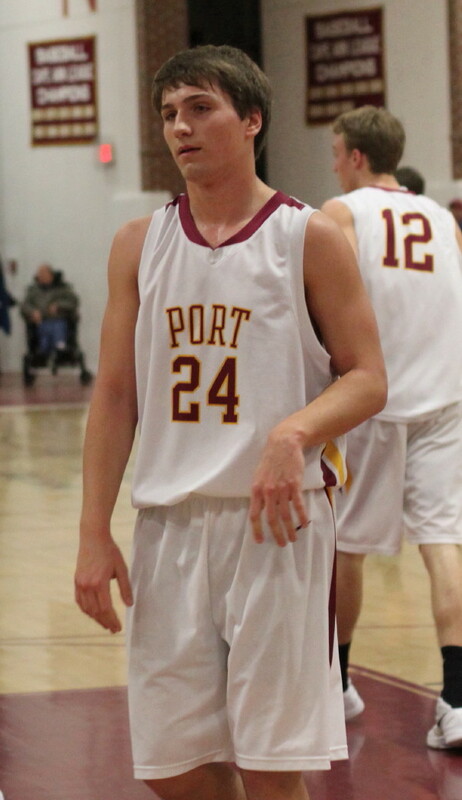 I once again met the gentleman who misunderstood what I do and embarrassed himself (and me) at Newburyport. He came over to talk to someone near me. 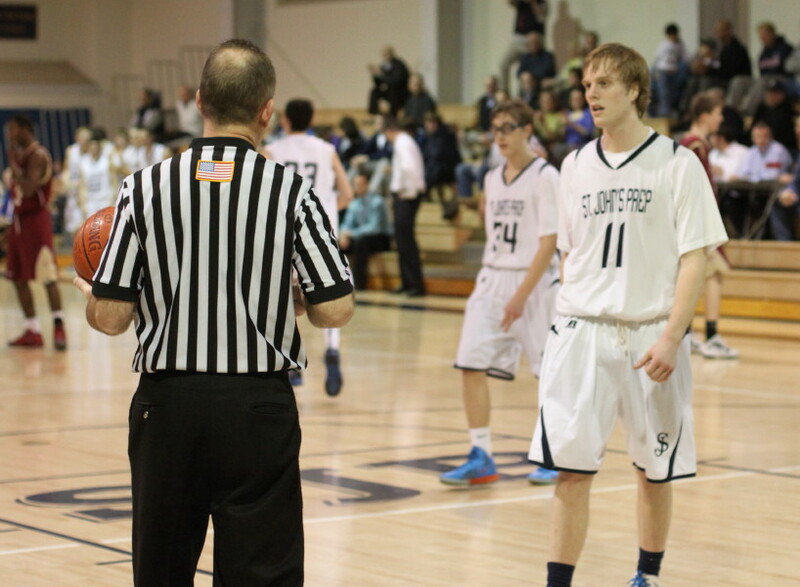 When I got a chance I asked him if he was “scouting.” He looked a bit stunned and left.